At the end of my sophomore year of college, I was working my second summer at Flintkote, the factory where my dad also worked. He worked in shipping, loading the trucks with the buckets and barrels of asphalt roof coatings, driveway sealers, and other “liquid products”. I worked on the line filling those containers and stacking them on the pallets for loading. I finished up work at the factory a week before classes for my Junior year and plotted a circular route around northern Illinois. Even at the age of 20 in August 1976, I had a vision that this may be the last time I would have this much freedom and a little extra cash so that I could just ride away on my own for 3-5 days. 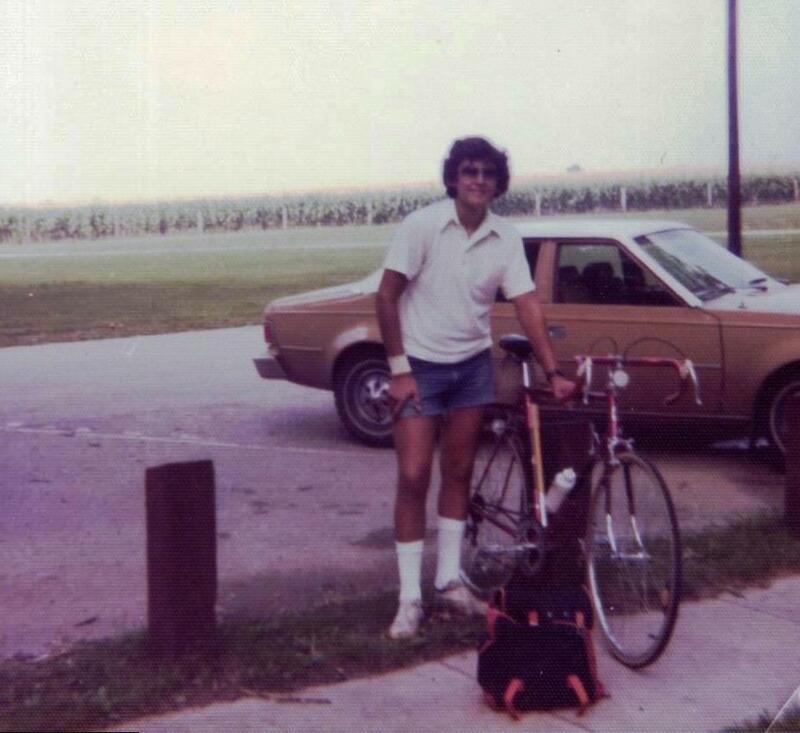 I don’t remember the exact route, but I left home in South Chicago Heights, IL and went west through Coal City, then up along US 6 through Seneca, Marseilles and finishing the first night about 85 miles down the road in Ottawa, IL. There was no Internet or cell phones. I had made reservations at some cheap motel in advance. Since I didn’t have a credit card, I had to carry enough cash on me. I think I hid an extra $20 bill in the seat tube that held my saddle. I was still riding in cut off blue jeans. I had no helmet or lights, but only rode during the day. I had no bike computer or odometer – just a Chicago Tribune map of Northern Illinois and a wrist watch to help me navigate and gauge my pace respectively. While I had a rear carrier that I could strap things on, I don’t think I had any panniers. All my clothes (mostly extra t shirts, socks, and underwear) were in the small nylon backpack I used to carry my books at college. In the side pocket of the backpack I was able to keep a small transistor radio with an ear plug. I listened to WLS and with Larry Lujack, Fred Winston, and Tommy Edwards to keep me company the miles went by a little easier. The next day I had made arrangements to stay in a dorm at Eureka College – famous because Ronald Reagan was an alumnus. I forget why, but in the end I stayed at a motel a little farther down the road in Washington, IL making a 75 mile day. The next morning I was off to Champaign, IL to stay with Bill Foertsch, who had been my room mate the previous year. At a stop in Bloomington, IL I had lunch with my cousin Frank Gayton, but otherwise it was just the WLS DJs who kept me company for the 90 mile ride. Even WLS was starting to get a little weaker as a I got closer to Champaign. After spending the night in Champaign, I was ready to do the 120 mile ride back home. My sew up tires were prone to flats. They may have given me extra speed, but they were not that durable. I had a frame mounted Silca tire pump, an extra tire and tools with me in case I had a flat. About 40 or 50 miles along the way, I had changed the tire and made an attempt to repair the flat. I think the spare had been patched before and I could tell I was still leaking air by the time I got to Watseka – still 50 miles from home. Thank goodness it was a weekend and someone was home when I made the call for help from a phone booth. I think it took just about all the change I had to make the call to “please come get me!” My dad was kind enough to come bail me out. I forget if he picked me up in Watseka or if I tried to pump and ride my way up another town or two. Either way, I had to take both wheels off the Raleigh to fit it into the back of the 1968 VW beetle that was the family car. My dad was great and didn’t think I was crazy for making a trip like this. I miss him greatly.